Here's why Pfizer, Ecolab, and NextEra Energy could be great stocks for investors in their golden years. Life expectancies have been creeping higher for decades, which is wonderful news for humanity. However, a longer life expectancy also means that many will be dependent on their nest eggs to sustain them for a longer time period. That's a big reason why we Fools are firm believers that even older investors can benefit from owning stocks. Of course, investors in their 70s shouldn't just buy any stock they come across. Instead, they should be highly selective about the stocks that they choose to own. Knowing that, below is a list of three stocks -- Pfizer (NYSE:PFE), Ecolab (NYSE:ECL), and NextEra Energy (NYSE:NEE) -- that I think are tailor-made for these investors. Here's why. The pharmaceutical sector is a natural hunting ground for investors who crave stability since the demand for drugs doesn't fall much when the economy sputters. A stock that I think is an ideal choice for older investors is Pfizer, one of the largest and most profitable drugmakers in the world. Pfizer owns a broad portfolio of drugs that can be depended on to crank out cash flow year in and year out. Included in its lineup are several legacy drugs such as Lipitor, Viagra, and Premarin, but also a portfolio of drugs that are firmly in growth mode. This includes the highly successful cancer drug Ibrance, the anticoagulant Eliquis, the rheumatoid arthritis drug Xeljanz, and more. Looking ahead, Pfizer looks poised for growth. It added the eczema drug Eucrisa and the prostate cancer drug Xtandi to its lineup through the acquisitions of Anacor and Medivation, respectively. Joining an already successful lineup, both of these drugs promise to become blockbuster sellers in the years to come. In total, market watchers expect Pfizer to grow its bottom line by more than 6% annually over the next few years. When adding in the company's generous dividend yield of 3.7%, Pfizer gives investors a low-risk way to potentially earn high-single-digit returns. I think that's an attractive prospect for a company that is trading for only 12 times forward earnings. Ecolab might not be a name that many investors are familiar with, but the odds are good that you've benefited from this company's products recently. Have you dined out at a restaurant? Visited a healthcare facility? Shopped in a store? If so, it's quite possible that you did business with one of Ecolab's customers. Ecolab is a leading provider of sanitation and cleaning solutions to a wide range of industries. While buying a company that sells products like hands-free soap dispensers, grease removers, and industrial-strength cleaners might sound boring, these products are all mission-critical to keeping their customers in compliance with regulators. Since the demand for cleaning products is recession-resistant, demand for Ecolab's services is highly predictable. That makes this a business that investors can count on. 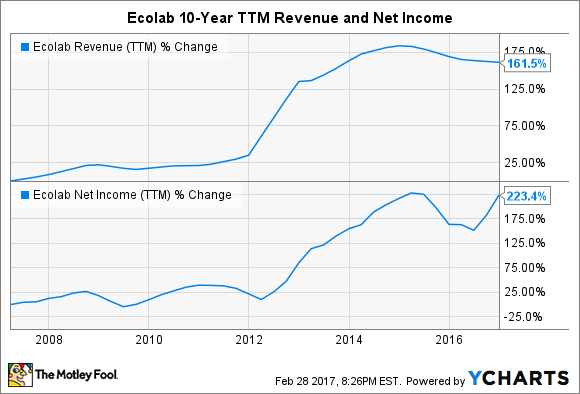 Ecolab's long-term financial results have been nothing short of fantastic. New-product introductions and acquisitions have helped its top line to grow in nine of the past 10 years, while cost-management share buybacks have allowed earnings to grow even faster. ECL Revenue (TTM) data by YCharts. The company looks well-positioned to deliver more of the same in the years ahead. While Ecolab's forward P/E ratio of 23 can hardly be called cheap, I think this is such a high-quality business that the premium valuation is more than justified. Add in a growing dividend that currently yields 1.2% and this is a business that low-risk investors can learn to love. With a market cap north of $60 billion, NextEra Energy may be one of the biggest companies that you likely have never heard of. NextEra is one of the country's largest utilities. This business is separated into two parts. The first is called Florida Power & Light and provides electricity to more than 4.9 million customers. Like most utilities, this business is rock-solid and cranks out dependable cash flow no matter what is going on in the economy. However, it's NextEra's other business that makes this utility so interesting. NextEra also owns NextEra Energy Resources, which is the world's largest generator of renewable energy from wind and sun power. NextEra has been investing in renewables for more than a decade, which gives it a nice leg up over other utilities that have been slow to embrace the change. As technological advances continue to bring down the cost of renewables, NextEra should easily find more renewable projects to fund, which should drive years of revenue and profit growth. Meanwhile, the company also has another growth kicker waiting in the wings. NextEra won the bid to acquire Oncor, a regulated electric utility in Texas that was formerly owned by the now-bankrupt TXU Energy. If the $18.4 billion deal closes, it will boost NextEra's revenue substantially. It will also provide the company with a great opportunity to apply its know-how and lower costs, driving predictable profit growth in the coming years. Between all of its growth projects, NextEra believes that it can increase its profits by 6% to 8% annually over the next few years. That's an attractive growth rate for a stable business that offers up a dividend yield of 3% -- and it makes NextEra a great stock for risk-averse investors to consider.